So... what do you DO all day? | We do things… and stuff. Sorry there was no post last week. The whole family got gastroenteritis. But we’re all finally feeling better, yay! The most important thing that happened this week was a big discussion between Bailey and I about goal-setting. It started out as a bit of an argument, but we managed to transform it into a very powerful discussion about how we could help her follow one of her passions even more. Bailey loves cooking and baking, and she has a desire for public recognition that she was expressing as “I want to be famous!” On speaking with her further, we decided that she could have a cooking show on YouTube. I had her look up storyboarding, and make a plan. She knows that she’ll only have 10 minutes (YouTube limitation) to do her show, so she is already planning how to edit for time but still keep things clear. She made a storyboard, and wrote a script for her introduction. In the next couple of days she will analyze her recipe and plan out how to make the recipe in front of the camera. She will measure all of the ingredients into small containers (just like on TV), and is looking forward to editing the video. She has also been writing a lot this week, and since she was so busy I didn’t have her write for this O4L. She spent quite a bit of time perfecting one of her stories. She also wrote a song. Bailey spent one night with her Dad this week, and is excited to meet his fiancee, who will be arriving from the United States this week. She and her Dad are getting along much better these days. They went for a very long walk while she was there, and he has been supporting her with learning more about cooking. She made an apple pie this week (at home) using his special recipe. We didn’t have enough apples for two pies so she had to halve the recipe. Another fun week! I had Bailey keep track of her favourite daily actvities, and here is what she said. I think I will help her keep track next week so I can get a little more information out of her. Not enough flour makes apple juice at bottom of tin. I drew Crystals [a teddy bear] and me. There are lots of options for your face. How to make paint from rocks. That my friends are awesome! I learned what Steve wants for hours at work and how much money he will make. Anyway, despite the above, Bailey did have an eventful week. One of the highlights was Friday night when I put aside my soapbox for the evening and watched the opening ceremonies of the Olympics with Bailey. At one point she said to me, “Doesn’t the Canadian part of you feel kind of proud?” and I had to admit that, yes, it did. We were both excited to watch to the First Nations dancers, too, as we knew one or two of them. This week was pretty busy, and again Bailey focused on her creative side and physical wellness. She has been using the Wii Fit everyday, and we have been going on more and more walks as the weather continues to be warm. I had her look up the reasons why I ask her to stay physically active even though it is not her favourite thing to do, and she was able to tell me that it helps prevent obesity, and it’s good for her heart, among other reasons. At her art class this week the children learned how to make paper. Everyone left the class with bits of paper pulp in their hair, so I think it’s safe to say that a good time was had by all. Bailey continues to work with designing fashions. She has many outlets for this, including paper dolls, a program online, a game for her Nintendo DSi, and her own clothing. She wants to learn to sew, so we are looking at getting a hand-me-down sewing machine from my mom for her to learn on. Also this week, and against my better judgement, I allowed Bailey to buy a big (and I mean BIG) bag of Jelly Bellies, her favourite candy. As a result, she has also researched, at my request, why she should be brushing her teeth even more often while we have this treat in the house! The Jelly Bellies have had an upside though, and I don’t just mean because she is sharing them! She had fun sorting the jelly beans into different colours, has looked up different flavour combinations online, and has researched how candy is made. I am going to have Bailey help me with the O4Ls, I think. I will have her write a quick blurb everyday to help remind me what she did that day and what her favourite thing was. She is pretty excited about that. Our biggest excitement of the week was a family trip to Kelowna, about two hours away. Unfortunately we weren’t able to do much else besides hang out at the mall, but Bailey loves going on trips, and we were able to look at many stores that we don’t have here in Kamloops. The mall has a time capsule, with two sections. One will be opened in 2030 and another in 2105, and we talked about how old she would be when they were opened (31 and 106, respectively). Bailey says that if we made a time capsule, she would put in a few coins from the current year, a pair of her shoes, and a book. Hi! Sorry this is late. We rearranged our entire living room to allow Ocean some more room to roam and that necessitated unplugging our computers for a few days. Bailey had a fun week. She went swimming with Steve and Ocean on Sunday, and they stayed in the pool for 3 hours! Bailey jumped off the small diving board and almost convinced herself to jump off the next higher one, but got scared at the last second. She has also been using the Wii Fit more often these days, trying out yoga and balance games. Kamloops has been having a remarkably mild winter, and Bailey and I have been in flip flops for weeks now. We took a nice, long walk mid-week, and Bailey rode her scooter most of the way. Also in the “Wellness” category, Bailey has been noticing that she gets grumpy when she is hungry, so we have been making more of an effort to pay attention to how much she has eaten, and what. This week was also a very creative week. She started her art class at the Kamloops Art Gallery, and did some work with pastels and charcoal. The class got a tour of the art gallery, and got to see an exhibition of Emily Carr’s and Jack Shadbolt’s work. Bailey was excited to help us with our living room rearrangement. Steve entered the dimensions of our living room and our furniture into a program called Rhino and we were able to test out numerous combinations before moving all the heavy furniture around. Bailey and I watched a DVD of Season 1 of Project Runway this week. We absolutely loved it, and Bailey got very inspired to create some more fashions for paper dolls. A busy, travel-filled week for Bailey! I dropped her off at her grandparent’s house on Tuesday night and they left for Sechelt on Wednesday. She did keep a journal, and told me lots of stories when she got home on Saturday so I will pass that along to you. As mentioned, she spent Tuesday night at her grandparent’s house here in town. Her Dad lives there right now, so she was able to spend some time with him. They made cookies, and he lent her some books, including one about the plants on the coast of B.C. She saw a Monkey Puzzle tree in Sechelt and tried to find it in the book. Other than that she just looked through the book for fun. On Thursday Bailey went to the beach with her Grandpa. She brought home three seashells for us. She thinks she noticed the tide going out. That night they went to Gibson’s and saw Avatar. Bailey loved it! She liked the cute stuff in the movie the best. Bailey’s big adventure on Friday was going horseback riding! 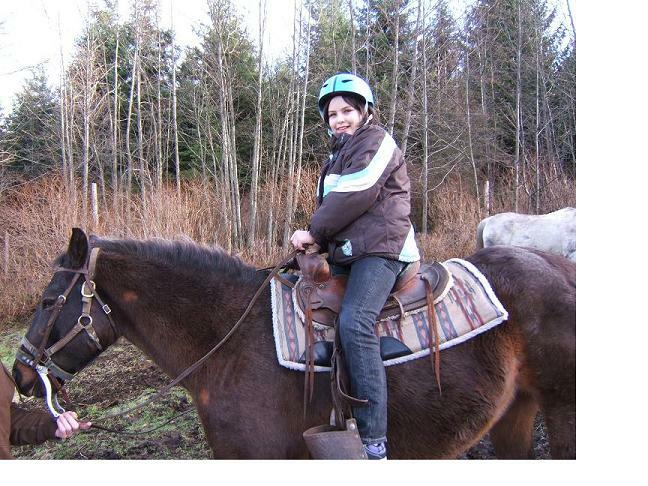 It was the first time she had ever been on a horse, and she wrote quite extensively about it. Her horse’s name was Jewel and her horse was tied to the owner’s horse just in case. She was a little scared at first, but by the end she was sad to go. They weren’t allowed to gallop but they did trot a little. Friday night she used her constellation book and tried to find some stars with her Aunt’s boyfriend, but it was a bit too overcast. They left early on Saturday. Bailey saw the Olympics countdown clock in Vancouver. She must have been listening to the criticisms that Steve and I have been making about the Olympics, because she gleefully told me about a particularly rude piece of grafitti she saw. “But they misspelled Olympics, mommy! They spelled it O-L-Y-M-P-I-X!” She was more offended by the error than anything else, ha ha. And that’s it! I’m on the mend from what I now think was food poisoning for sure, so hopefully Bailey will have a fun week this week, too! It was a boring week for Bailey, I’m afraid. As I mentioned I was sick early in the week with a stomach bug, and ever since then I’ve been quite weak. However, she is a very understanding kid so she was able to make the best of the situation. She was really inwardly focussed this week, and did a lot of work on “self-improvement.” Because Steve and I were sick, Bailey had to be a bit more self-reliant this week when it comes to food, and she enjoyed the challenge, even taking it to the next level and making a lunch meal plan for herself. She attempted to make bread this week, and it sure was delicious, although it didn’t rise as much as she wanted, possibly because she cut the recipe in half. She also played “house” this week with her many dolls, creating an elaborate scenario in which she had 8 kids. Bailey is still enjoying her keyboard, and has offered to teach her friend what she knows. Bailey made a worksheet for her friend, and is looking forward to teaching her soon. Bailey is excited about the coming week as she is going to Sechelt with her grandparents to visit her Aunt. She has been busy looking at Google Earth to see where they will be going.